Some things are eternal, for instance the ties that bind fathers and daughters and which cannot be dissolved by time or distance or loss. 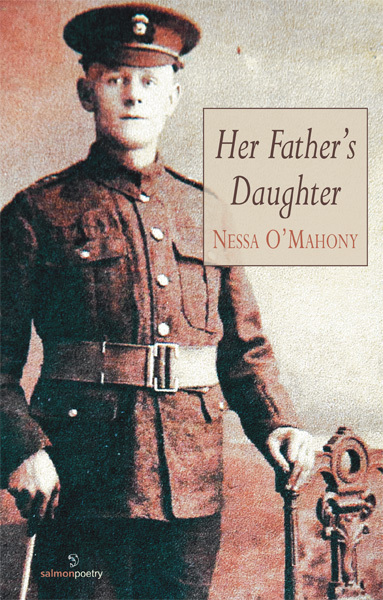 In Nessa O’Mahony’s third poetry collection, she examines the nature of those bonds through poems that combine the autobiographical with the historical as she explores poetically two very contrasting father-daughter relationships from two very contrasting periods of Irish history. Nessa’s grandfather, Michael McCann, was a quintessential Irish nationalist of the early part of the 20th century. He fought for the British in World War I, then fought against the British in the Irish War of Independence and finally fought his fellow countrymen in an Irish Civil War. In this collection, Nessa presents a parallel sequence of poems, one relating to her relationship with her own father, whose decline and death she charts with painful honesty, the second exploring the life of her grandfather, a more mysterious figure whose story slowly emerges through her mother’s memories, and her own research. The result is a meditation on love and losing and on what is retained through narrative and memory. 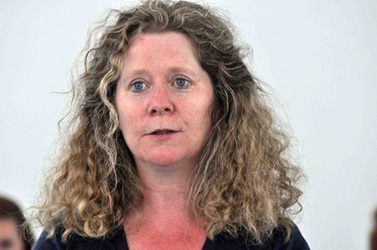 Nessa O’Mahony was born in Dublin and lives in Rathfarnham where she works as a freelance teacher and writer. Her poetry has appeared in a number of Irish, UK, and North American periodicals and has been translated into several European languages. She won the National Women’s Poetry Competition in 1997 and was shortlisted for the Patrick Kavanagh Prize and Hennessy Literature Awards. She was awarded an Arts Council of Ireland literature bursary in 2004 and 2011, a Simba Gill Fellowship in 2005 and an artists’ bursary from South Dublin County Council in 2007. She has published two previous poetry collections, Bar Talk (Italics Press, 1999) and Trapping a Ghost (Bluechrome, 2005) as well as a verse novel, In Sight of Home, Salmon Poetry (2009). on when you sent it. on the Book of Joshua? you’d only take it out after hours. trimmed it down to size. it still bears its weight. for the green on frosted hills. claws tap worm-morse; little stirs. that movement is always forward. the twitch of a closed eye. But this is not a ‘sad’ book. It confronts death, yes, but similarly confronts life and its contradictions: in ‘Visitor’, a garden mouse is a ‘word hovering / out of reach’ ; in ‘Feast of the Epiphany’ the snow outside a window is ‘a whiter screen / that might just erase / all sins, all memories.’ Don’t be fooled by the crunching, beautiful sadness of a father’s death, O’Mahony seems to say. There is more, she reflects: in ‘Doorways’, where, inevitably, ‘the old sock would find / the old shoe // eventually.’ This fine, fine collection is filled with the grace of motion towards, and movement beyond. O’Mahony should not reproach herself: Graham Greene’s famous insight that there is ‘a splinter of ice in the heart of a writer’ came to him in hospital, as he listened to and watched from a nearby bed the tears and cries of a mother whose son had just died, thinking: ‘This is something which one day I might need.’ … At its best, though, O’Mahony’s forthright, heartfelt style is affecting, and further exploration of her family hinterland will no doubt yield up other secrets. A few years back, Nessa O'Mahony hurriedly slipped a volume of poems into my hand in the National Library in Dublin while we were jointly labouring for the arts at an event there. Equally hurriedly, because as usual in Dublin or anywhere I was making a beeline for the train at an inopportune hour and with slim chance of making it, she had inscribed it simply for me. There were poems or rumours of poems. And much activity I think in the years between. Activity which I have to confess was already smart and cute, in the best sense, and digital and contemporary in a way, 15 years ago, most of my generation would not, could not, have recognised. There was the steady accretion of a reputation on her part; the National Women's a Poetry Competition in 1997, short listings in the Kavanagh and Hennessy prizes; a volume of poems, Bar Talk, from Italics Press, in 1999; the sense I would say of a fugitive imagination, unexpected, charged unusually with an inner frankness amid formal poise and the opposite of ostentation and self-regard; the respect of emerging writers testified to time and again in bulletins from creative writing zones and masterclasses. That generous artefact which is the Electric Acorn, surely one of if not the first genuinely digital literary magazine in Ireland, which she edited. And in individual poems themselves, the sound of skills being gathered in. Then in 2009, she published a book I encountered directly on my own accord. In Sight of Home is a verse-novel; it is also an epistolary narrative; it is also a work of excavation and recovery; of leaving and returning, with gains and losses; and also - and also - a work which introduces the reader to a kind of Nessa doppelgänger. It is, frankly, an intimidating book in its framing, the techniques on show, its imaginative range. But it represented what you could call 'a run at' themes and contexts for which, I think we can see now, the earlier experimentation, the daring, the risk-taking of her digital and fugitive imagination, was quietly preparing her. On the train back to Belfast, I read the volume of poems she had given me, twice at one sitting. First, as usual from back to front - it's an OCD thing - and again in its intended sequence. Trapping A Ghost was and is, as they say, an eye-opener. Published in 2005, it sits on the other side of In Sight of Home as her new collection - the one we are gathered this evening to celebrate - sits on the near side of that book. Look. There is so much slabber about poems and poetry. There is a thing called a writer's career. It is not a nebulous term. What happens is, first poems and then a pamphlet or collection, set up a kind of community of common conviction. Conversations between poems from, as it were, different eras of a life; first poems find their most appropriate readers and often their sternest critics among the cluster of later poems; it is a stern moment when later poems, even the most recent and most proud, find themselves under the scrutiny of earlier works. Nonetheless, the conversations are irresistible, inevitable; always - always - fruitful; and always, weirdly, utterly anonymous. Poems don't give a damn whose they are; just that they are and are, in a peculiarly vain way, still valid, still loved. Later poems reassure them they are still beautiful. Anonymity is the key. That is what happens when a body of work, a corpus, gathers itself over time. It is irresistible in its action. This may seem fanciful, or some manner of whimsy. But as with most things, it is when the action gets interfered with that the truth of the observation is visible. Hence the sensation currently underway regarding Derek Mahon's revisions of his own famous earlier poems in more recent editions of selected and collected poems. In that instance, the poet still believes his or her authorship supersedes the aesthetic rights of the poems to live and flourish in their own tongue. It is a rough lesson but the poet will surely find, once he or she has passed out of the moral reckoning, that the poems reassert their rights and the appropriate versions will endure. This is a roundabout way of saying that Trapping A Ghost, which is a collection of poems about family and history and context and Ireland and loss and love, sustained and enervating lyrics which are bereft and difficult, disturbed by absence and bothered too by the excitement of an adventurous future, is itself augmented and nuanced and challenged and blown open by In Sight of Home - who knew? More than any other artform - I believe this as an article of faith - poetry when it is good pushes through the intensity of the personal and private into the anonymous world dragging the intensity with it but exposing it to the commonwealth of all our experience. It is why poetry makes us feel a thing as if it were our own; we are not the spectator at events affecting others, but are ourselves made players. So this is what I am here to say about this poet and this collection. Both her previous mature courageous artistic ventures now, I think, find another cadence, another variety of utterance, another interlocutor which is challenging and robust, both fixed and unfixed, concerned intimately both with history and its opposite - not forgetfulness, but, in fact, love. Her Father's Daughter is an impressive volume. Maturity, confidence, an achieved voice, dexterity among the debris (historical, emotional), bringing to the long dead and persistently silent all the freshness of contemporary loss and love. The old cautious punctiliousness of poetry is never more exhilarating than this. What a wonderful thing to have put on record.